The “Re-Timer” Effect: How To Re-Time Your Circadian Rhythms If You Wake Up Too Early Or Stay Up Too Late. Some people say they’re most productive after midnight (*ahem* Tim Ferriss, Matt Mullenweg, etc.?). I’ve got news for you: that ain’t normal. Below is a graphical representation of the sleep patterns of a normally timed, late timed and early timed body clock. Your normal circadian rhythm is ideally timed to the top graph: the normally timed body clock. In other words, in an ideal 24 hour cycle, you’re supposed to wake up sometime between 6am and 7am and you’re supposed to go to bed sometime between 10pm and 11pm. It’s just the way we humans are wired. Unfortunately, airline travel, jet lag, modern lighting, electronic screens, WiFi and bluetooth signaling and other cues that fly in the face of natural daily sunlight and natural evening darkness can throw your body clock entirely out-of-whack. Rather than fixing the problem, most people will simply begin making excuses that they’re a “night owl” or an “early bird”, all while beating up their biology with an unnatural circadian rhythm alignment. So if that circadian rhythm pictured above isn’t optimized and your body’s clock is not timed properly, your hormones will suffer, your fertility will suffer, and your longevity will suffer. In today’s article, I’m going to teach you exactly how to use something called the “Re-Timer” and the use of green-blue spectrum of light to shift a delayed, late-timed body clock back to where it needs to go, and how to shift an advanced, early-timed body clock back to where it needs to go. Before you learn how to shift your body’s clock, it’s important to understand how your body’s clock responds to the cue of light. Light is electromagnetic radiation that specifically falls within a certain part of the electromagnetic spectrum. The word “light” usually refers to visible light, meaning light that is visible to your eye and is responsible for your sense of sight. Visible light is specifically defined as light that has a wavelength in the range of 400-700 nanometres (nm), which falls just between infrared light (which is light with longer wavelengths) and ultraviolet light (which is light with shorter wavelengths). But in the meantime, let’s focus on visible light. The main natural source of visible light on earth is, you guessed it, the sun. Sunlight provides the energy that green plants use to create starches, which then release energy into the living things that digest those starches. This process of photosynthesis provides just about all the energy used by life on earth. And yes, that light emitted by the human body can even be photographed, via a process called “Gas Discharge Visualization” (GDV), which you can read about in detail here, and which I am also working on a separate blog post/podcast about. Anyways, back to visual light. The specific properties of light are generally measured in terms of intensity, propagation, direction, frequency or wavelength, and polarization. The speed of light, measured in a vacuum, is 299,792,458 meters per second, and is one of the fundamental constants of nature. Visible light, as with all types of electromagnetic radiation (EMR), is experimentally found to always move at this speed in vacuum. Often referred to as the “internal body clock”, the circadian rhythm influences the timing of all our bodily rhythms, including our sleep-wake rhythm. The cycle is completed approximately once every 24-hour period, which is why these regular rhythms are called circadian (circa=about, dian=day) rhythms. The timing of these physiologic circadian rhythms can become altered, leading to changes in the phase relationship of rhythms to each other, which can cause internal desynchronization. Sometimes this desynchronization manifests as jet lag, sometimes as insomnia, sometimes as waking up extremely freaking early even though all you really want to do is just sleep in a little bit. As you may have experienced at some point in your life, a loss of coordination of these rhythms can have negative consequences on your productivity, your appetite, your happiness, your social interactions, your workouts, your focus, your immune system and many other physiologic and behavioral functions. So ultimately, the less desynchronized your circadian rhythms are, the better your life. This is mostly related to a big disruption in the production of monoamines and hormones that affect your sleep-wake cycle and wellbeing, including melatonin, serotonin, dopamine, noradrenalin, leptin, ghrelin, etc. Light is the most important and potent stimulus for circadian entrainment. You now know that the early timed and late timed body clocks are simply perfect examples of a CRSD. Delayed Sleep Phase Disorder (also referred to as sleep onset insomnia) can cause you to have difficulty falling asleep at your desired bedtime. Typically, you would be unable to sleep until after midnight and then find it difficult to wake up early in the morning for school or work commitments. Advanced Sleep Phase Syndrome (also referred to as early-morning awakening insomnia) can cause you to feel overwhelmingly sleepy during the early evening, essentially rendering you unable to stay awake. Your “ideal” bed time may be as early as 7pm, causing a wake time of around 3am, which significantly impacts your work and social life. So what exactly is it that can disrupt your circadian rhythm like this and cause a CRSD? Lifestyle factors: lack of bright light in morning and presence of bright light at night can shift your circadian rhythm forward. Too much bright light too early in the morning and “shutting off” exposure to light too early in the day can shift your circadian rhythm backwards. Shift work: working different shifts requires you to adjust your sleep-wake times to accommodate your work life. Often this means having to sleep during the day, which is contrary to your body’s natural rhythm, or experiencing fatigue during your shift. Travel: frequent travel may require you to cross multiple time zones. This can disrupt your existing sleep-wake rhythm and result in you feeling jet lagged and unable to sleep. Seasonality: lack of morning light during the winter can cause you to have trouble sleeping at night and then waking in the morning. 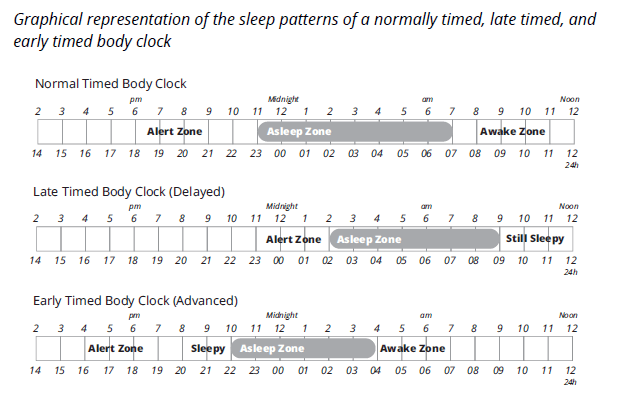 If you want more nitty gritty details on CRSDs, you can download Circadian Rhythm Abnormalities (.pdf download). Just like I described earlier in this article, you’ll see that for each of these lifestyle and biological factors, appropriately timed bright light therapy is the most effective method for re-timing circadian rhythms and consequently improving sleep and biological function. The information your body gets about existence or absence of light is received via light-sensitive receptor proteins in the eye’s retina. These proteins are called opsins. Opsins convert the photonic energy of light into electrical potential in neurons, and project signals from light to the brain’s biological clock, as well as to other brain areas. This then increases neurotransmitter signalling and influences hormone production. These light-sensitive receptors are not only found in the retina, but also in many locations in your brain and body, such as the cerebrum, the hypothalamus, inside your ears and on every inch of your skin (which is why, by the way, it’s very important when you sleep in darkness at night to not just limit light exposure to your eyes, but also to your skin). You already know that the most important external indicator to help keep your body synchronized with this routine is light. Sure: exercise, food, air, etc. all effect your body’s clock, but nothing beats light. Why is light so important to your circadian rhythm? Because when your eye senses light, it sends a signal to your brain to be awake. As it becomes dark in the evening, your body produces melatonin, telling your body it is time to sleep. The combination of biological processes in response to light and darkness are crucial factors for your body to remain synchronized and sleep at the right time. If you do not receive light at the right times due to the winter months or lifestyle factors or shift work or jet lag or any of the other contributing factors I’ve covered already, this can confuse your circadian rhythm, leaving you unable to sleep when you need to and contributing to all the biological issues described above. Light therapy (also known as phototherapy) simply involves exposure to specific wavelengths of light for a prescribed amount of time at a specific time of day. For example, morning bright light therapy can adjust your body clock to an earlier schedule through repeated exposure to bright light appropriately timed in the morning. Evening bright light therapy can re-time your body clock to a later time by exposing you to bright light visual stimulation in the evening. Again, this all works because light exposure is your body’s primary cue to regulate your body clock. What Kind Of Light Is Best For Light Therapy? Bright light therapy has been used to treat the winter depression of Seasonal Affective Disorder (SAD) for decades. According to Mayo Clinic, light therapy is the most recommended and main form of treatment for Seasonal Affective Disorder. Traditionally white light therapy has been used, however research has now shown that white light many not actually be the most effective form of light therapy, and may even cause retinal damage if overused. Instead of harsh white light, green-blue light has actually been proven to be more effective at re-timing the body clock and suppressing the production of melatonin (Lack et al. 2004). One reason for this is because our eyes contain a lens that becomes cloudy and yellows as we age. This clouding actually restricts blue light from entering the eye. Since most white light emitting devices (often called “blue light boxes”) rely solely on blue wavelengths, green-blue light is actually considered to be a superior treatment option in older populations. Research has actually looked at compliance to treatment with these white light emitting boxes and found that not only is the white color not the correct color, but compliance is quite low, probably because it’s quite difficult to lead a busy life and spend time each morning sitting still while staring at a light box. Later in this article, you’ll see that practicing sleep psychologists have invented portable light therapy that not only contains more of the physiologically appropriate green-blue light wave spectrum, but also increases compliance to light therapy treatment. The majority of research has found that your circadian clock can be advanced to an earlier time or delayed to a later time when using light comprising a peak wavelength in the green-blue spectrum. Let’s take a look at some of the research that shows green-blue light to be superior to white light when it comes to re-timing your body’s circadian rhythms. Conclusion: The experimental groups showed significant melatonin suppression during light stimulation, with the blue-green LEDs producing the greatest (70%) suppression. Conclusion: The shorter wavelengths of 470, 495 and 525 nm showed the greatest melatonin onset advances ranging from approximately 40 to 65 minutes while the longer wavelengths produced no significant phase advance. Conclusion: The blue light group showed a significant 2.53-h advance of dim light melatonin onset, compared to no change in the control group. However, neither group had a significant advance of sleep times following treatment. Effective delayed sleep phase syndrome treatment may require adjunct behavioral instructions. Conclusion: Percentage melatonin suppression on night 1 and dim light melatonin onset (DLMO) for each night were calculated. The shorter wavelengths of 470, 497, and 525 nm showed the greatest melatonin suppression – 65% to 81%. The shorter wavelengths also showed the greatest DLMO delay on night 2 – ranging from 27 to 36 minutes. The results were consistent with the involvement of a scotopic mechanism in the regulation of circadian phase. Olsen, B, Szkibik, N & Chau, A, ‘Green light is effective in advancing the timing of sleep onset and increasing duration of sleep’, 2013 August. Conclusion: Baseline data provided by participants prior to the trial showed the average sleep onset time was 1.47 (SD = 82 minutes). The average preferred sleep onset time participants wanted to achieve was 23.00 (SD = 56 minutes). This would be an average advance in sleep onset of 2 hours and 47 minutes, a significant change in the circadian clock. 92% (n = 22) achieved a movement towards their preferred sleep onset time; 8% did not realize any movement in their sleep onset time. An average advance of 2 hours and 30 minutes was achieved across the sample (n = 24). For green light to be considered an effective treatment option, duration of sleep should either be constant or increase as sleep onset time advances. Reduced sleep duration would result only in sleep debt. Average sleep duration before the study was 7.1 hours (SD = 1.4 hours). On the 7th day of use, average sleep duration of participants was 7.8 hours (SD = 1.92 hours), an increase over the baseline measure by 0.7 hours (42 minutes). Based on the studies above, green-blue 500nm dominant wavelength, UV-free light is the most superior form of visual light to expose your eyes to when it comes to aligning your circadian rhythm. Green-blue light is most effective at re-timing your body clock. If you pay attention to my Instagram and Snapchat feeds, or to biohacker Dave Asprey, it’s no secret that we personally use green-blue light for the eyes, especially after a bout of travel or circadian rhythm disruption. Lately, you may have seen me wearing a slightly odd-shaped set of white eyewear that produces the exact spectrum of green-blue light I described earlier in this article. The set of white eyewear, is called a “Re-Timer“. Re-Time Pty Ltd is the company that makes the Re-Timer, and was formed in 2010 to help people re-time their body clocks and improve sleep. Initially, led by Professor Leon Lack from Flinders University, Re-Timer has been researching and developing the world’s first wearable green-blue light therapy device since 1987. Over the past several years, a team of seven engineers, two ophthalmic experts and two sleep psychologists designed the Re-Timer. Over one year (1,900 hours) of work time was spent on computer-aided design alone as the team worked to incorporate the latest sleep science from Flinders University into an ergonomic, lightweight and portable wearable device. Four design iterations and 160 logged design changes later, Re-Timer was launched worldwide in November 2012. Since then, thousands of units have been sold worldwide. Today, Re-Timer is assembled in a state of the art clean room, in Adelaide, Australia, and has been sold in more than 40 different countries worldwide. It is actually the world’s number one selling wearable light therapy device. The team at Re-Timer is led by Professor Leon Lack (pictured below), who is a Clinical Psychologist at the Adelaide Institute for Sleep Health (AISH). He is also a Professor of Psychology at Flinders University. Dr. Lack is acknowledged internationally as one of the world’s leaders in behavioral management of insomnia and has conducted extensive research in sleep, circadian rhythms and insomnia over 30 years. For the last 20 years he has directed a clinic for the non-drug treatment of insomnia at AISH and has supervised many clinical Masters and PhD students in this area. He was a co-founder of the Australasian Sleep Association and its president from 1989 to 1992. Leon is also the author of 80 peer-reviewed journal articles and has received research grants from bodies including the Australian Research Council and National Health and Medical Research Council. Leon earned his PhD from The University of Adelaide and received his Bachelor of Arts from Stanford University. Here’s how the Re-Timer works. You simply wear it while you are awake either in the morning or evening, depending on how you want to change your sleep. For example, one recommended schedule to change your sleep is typically seven days for 30 minutes each day. To treat Winter Blues, Re-Timer can be worn daily throughout winter or just used on the darker colder days when you want to boost your energy and mood. It delivers light at the optimal delivery angle. Most light entering the eye is from below, so the Re-Timer replicates this. If light were delivered from above it would be blocked by your eyebrows, diminishing performance. The Re-Timer light is UV-free and has been independently tested for eye safety to the international standard CEI IEC 62471. It comes with an embossed travel case, a USB cable for re-charging, a long lasting lithium ion battery and a 1-year warranty. Size 7.9” 5.5” x 2.2” or 200 x 140 x 55 mm. One size fits all. Light pulse 50 to 166 hertz. Not suitable for those who suffer epilepsy or similar conditions. Basically, you can consider the Re-Timer to be the complete polar opposite of blue-light blocking glasses. Blue-light blocking glasses block blue light from entering your eyes, while the Re-Timer shines into your eyes with green-blue light far more powerful than what you’d get from a phone, television, computer, etc. When you use the two of them strategically throughout the day, you can tweak your circadian rhythm forwards or backwards, whichever you choose. There are a few different ways I have used my Re-Timer to adjust my circadian rhythm. First, for 1-3 days before I travel from East to West across multiple time zones, I can wear them for 30 minutes when it’s morning where I’m going. So if I want to be wakeful at, say, 7am in the West, I’ll use the Re-Timer at 10am in the East. Then, when I’m in the West, I simply use the light for another 30 minutes either when I wake up or while I’m sitting drinking coffee and checking my emails. I’ll also wear them in the sauna, while walking around outside, during a workout, etc. Next, I’ve had a few races for which I’ve had to wake up 1-2 hours before my normal waking time. In these instances, I’ve instantly eliminated the normal grogginess from getting up earlier than usual by simply using the Re-Timer as soon as I wake up in the morning. On several occasions, I’ve worn the Re-Timer on a sunless day and used it just after lunch, when afternoon sleepiness and mild amounts of seasonal affective disorder would normally set in. Both times, it’s completely eliminated the need for a nap, and although it could certainly be a placebo effect, seems to lift my mood, focus and cognitive performance as well. I’ve also had several times since getting my Re-Timer that I’ve gotten into a pattern of waking up too early (which you know now is a mis-timed circadian rhythm), such as at 5:00AM, when I’d rather sleep until 6:30AM. Each time, I’ve pulled myself out of that pattern by getting up at 5:00AM, avoiding any sun exposure and wearing blue-light blocking glasses, and then at 6:30AM (the time I’d rather be waking up), wearing the Re-Timer for 30 minutes. So in this way, I can shift my circadian rhythm forwards, or backwards. The Re-Timer could also be used when you’ve traveled to, say, the West. Let’s say you have a party, a dinner, a social event, a conference, a speech, a meeting, etc. at 7pm, which for you, if you come from the East, would be, say, 10pm. You could use the Re-Timer beforehand for a quick blast of energy as an alternative to caffeine or some other stimulant. The Re-Timer website also has a Jet Lag Calculator that will tell you when to receive light to reduce jet lag. Sleep scientists Professor Leon Lack and Dr. Helen Wright, who I mentioned above, developed this algorithm, which considers your departure and arrival cities, as well as your current sleep pattern. The calculator is also available as a free iPhone App. A customized schedule is then generated for you, based on the information you entered. The schedule will outline the best time to wear Re-Timer glasses to change your sleep times. Of all these three options, only bright light exposure has none of the side effects or risks known to be associated with the use of high doses melatonin or pharmacological agents used to treat and avoid jet lag symptoms. But from shift work, to an annoying habit of waking up too early, to not having any productive time until late at night, to other forms of circadian rhythm disorders, this type of device can be used for far more than simply jet lag and airline travel. And for you true circadian rhythm biohackers out there, in an ideal “morning habit” scenario, or after landing in a new destination across multiple time zones, you can throw in a bit of infrared sauna, cold thermogenesis and kundalini yoga too. If you’re waking up super early, that’s not normal. It’s a disorder. It can eventually kill your biology. The same goes with a propensity to stay up late. You can click here to order a Re-Timer. Use discount code BGF30 for $30 off your purchase. Do you have questions, comments or feedback about the “Re-Timer effect”, how to re-time your circadian rhythm, the Re-Timer or anything else from this article? Leave your thoughts below and I’ll reply. Great article. Question, what are my options if I have to wake up at 5am for work, and not the ideal 6-7am? Would this work for me to “reset” my circadian rhythm? Hi Ben! Fantastic article as usual. I was gonna order this but as of May 2018, their iOS app is not available anymore as not compatible with iOS 11. Have you tried the AYO glasses (website is goayo.com). I would love to hear your opinion on those. I use a dawn simulator. Do you recommend additional light therapy? If you still need help with getting to bed or waking up, yes. For the Re-Timer? You used BGF30? Can you try again, and let me know if you're still having trouble. It's working on my end. Thanks! What happens if you feel sleepy or groggy in the early evening….but if wait it out and end up on computer until 10 or so. Sleep quality not good according to Fitbit benchmarks. Too little deep sleep which is phase advanced from early night to early morning. She tried the Re-timer > 1 month twice: first 2 h from 15-17h and then 1.5 h from 18.30 – 20h. Problem not solved. Please advice (=some schedule) we can try. Might using the Re-timer for 50 min. in the morning be worthwhile trying? Yes, she can use it for longer but make sure it is IN THE MORNING! I am trying my re-timers in the morning for the first time for SAD. Ben, I read what you wrote above about using them around mid-day if no sunlight and low mood. I will try them then also. Do you know any effects from wearing contact lenses on the circadian rhythm? i sleep terrible since i got contact lenses every day waking up at 4:30AM, weird times that i’m tired and active and so on.. If they are colored lenses, then yes.. clear shouldn't be an issue. thanks for the fast Reply! they aren’t colored but they are UV blocking? Going to put these to the test as I am leaving from NYC for Tokyo on the 21st. Thanks Ben! I saw these on Dave Asprey’s Facebook page last year and bought them. I love my re-timer goggles – great for jet lag and getting through the Seattle winters. Thanks for all the science, I didn’t know all of this info so thank you for sharing! Thanks Ben – another great post! I’ve used both Human Charger and Re-timers and I think the Re-timers work the best. A neurologist friend of mine told me about them – and I think that the research about green and blue light entering the photoreceptors in the eyes is very solid. Very timely article Ben, since I just got home from a 6pm to 6am night shift when I came home and found this article. I really appreciate your superb breakdown of all the science. My question is, on a day like this where I’m coming off three nights how would I use the re-timer to fix myself? Re-Timer helps with night shift in three ways. 1. Wear it in the evenings before your first night shifts to stay up later and start shifting your circadian rhythm. This will help you prepare for night shift. 2. Wear it during night shift (or on a break during shift) to stay awake and alert, and to shift your most tired period (say 4am) to outside of your shift (to when you get home and want to sleep, say 8am) and 3. Wearing it in the morning when you’re coming off your shifts to get back into normal timing and regulate your sleep-wake cycle on your days off. The company creates schedules for shift workers, so if you email them your shifts they can customize a schedule for you. I’m wearing blue blockers just reading this blogpost on my computer. I think it would be ill-advised to use blue light (or blue-green) in your eyes, since that’s probably one of the major causes of forniculated sleep. I’ve had upteen decades of fluorescent lighting in an office environment, tons of computer time, tablet time and phone time. Ergo, my sleep probs. All of these and non-native EMF’s are messing us up big time. I’ll try the human charger, and maybe by the vielight, but I’m not about to go this route. I think there’s a big danger in losing the DHA from your peepers with this devise. P.S. Love your site, love your book, love the blog. Light at the right times is good for you!! :) Light regulates our sleep and circadian rhythms. All white light contains blue and green wavelengths. We need light. If you have trouble falling asleep, you want UV free blue-green light in the mornings but then use your blue blockers at night when you’re on the computer. Light in the evenings is for when you’re flying west. Its all about the timing and the wavelength. Blue-green light is the most effective at stopping the release of the hormone melatonin. Ben’s right, there is a lots of research out there on this. The light is 100% UV-free and this device has been tested for ocular safety to the international standard CEI IEC 62471 which looks at blue light exposure. Blue-green light is a safe and effective way to adjust your circadian rhythm. If you have trouble falling asleep at night, get green-blue night in the morning and then wear you’re your blue blockers at night. You’d use green-blue light therapy in the evening if you wanted to be able to stay up later (say you’re preparing your body clock for a trip NY to San Fran). Exposing yourself to blue-green light is good if you do it at the right times. This light is important as it regulates your sleep-wake cycle and other biological processes (mentioned above). Does wearing contacts change the effectiveness of the Re-timer? Clear contact lenses are fine. Tinted lenses / sunglasses can reduce the effectiveness of light therapy. From your personal exp using them both, how would you compare this to the HumanCharger? Thanks Ben! I like BOTH, frankly. I still use HumanCharger and have even used both simultaneously (along with intranasal Vielight) to enhance effect even more. It's all about better living through science, baby. I also jave the same question as Drew. If only one was possible, which one would you prefer? If you can only afford to buy one, which would be your pick? Great information! How does this differ from the human charger or intranasal light therapy? I know you’ve talked about both before.